It’s the first day of fall! Who else has been excited about this day? We’ve been looking forward to the cooler mornings and evenings. I love seeing the trees begin to turn and the air having a crisp feel to it. I love apples, I love pumpkins, and I love thinking about the upcoming holidays. Today I set my fall tablescape in our new house. We moved here in the spring and this is the first time we’ve had a formal dining room. I’ve been so eager to decorate the table for the seasons! This year I’ve been inspired by gold and copper. I’ve been experimenting with mixing the colors and am pleased to see how beautifully they go together. I’ve also been in love with all things buffalo check (as you can see here and here… and here haha!). I found these beautiful buffalo check napkins and just HAD to have them for my fall tablescape. I doubled them up with these lace trim chambray cloth napkins inside the floral napkin rings for extra fluff and volume. Since I’ve been loving natural woods and greenery, I used them in place of a table runner or tablecloth. I added a fir garland down the center of my table. 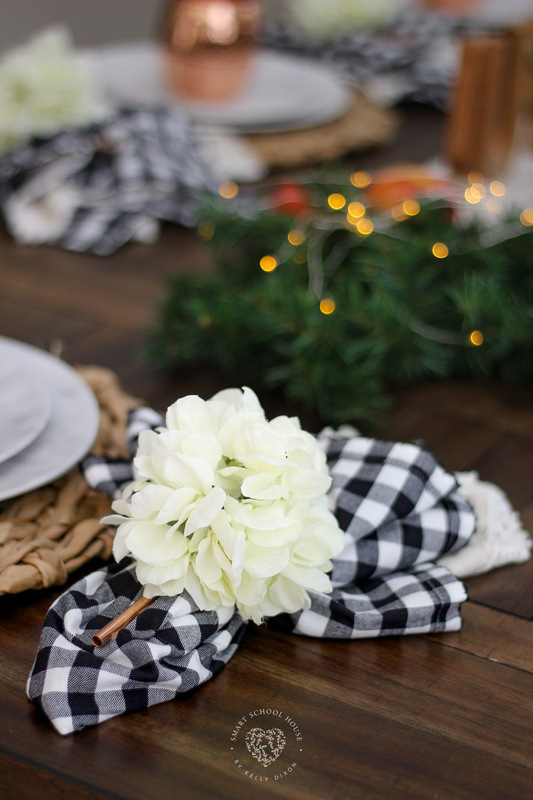 This is garland that I originally used for my Christmas decor, but the green looks so nice with the buffalo check and wood table. Then, I added string lights to the garland to give it a warm glow. 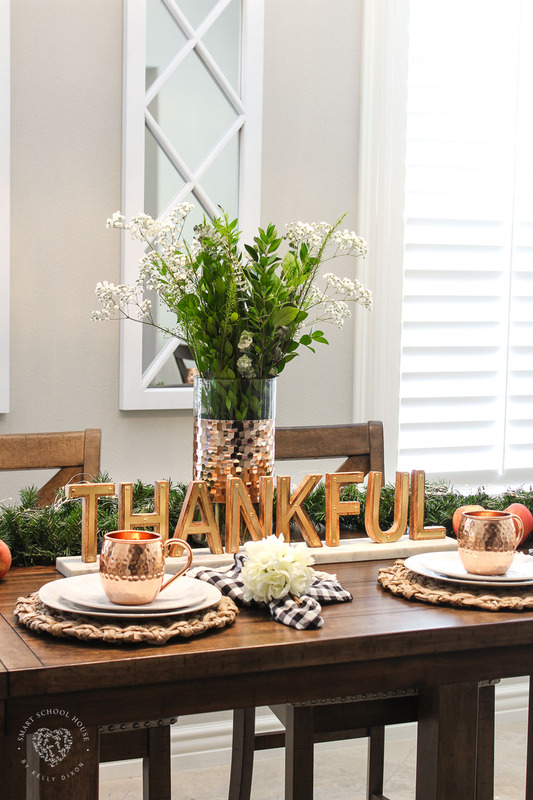 It’s so welcoming, just like a fall tablescape should be! Our table is counter top height, so it’s just slightly taller than a traditional table, but not as high as a bar height table. Our formal dining room is open and large, so a table that stands taller than usual helps fill the space. Moscow Mule anyone? 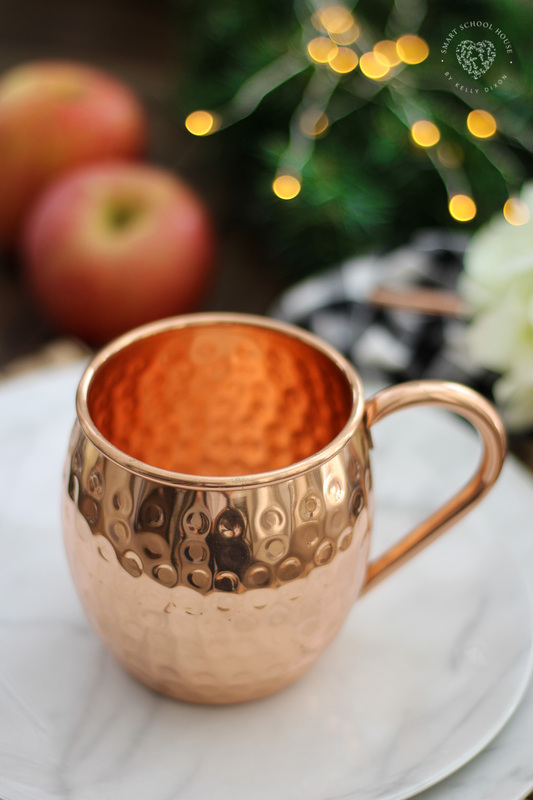 Cozy copper mugs were made for the fall! The kids love to use these mugs and so do I 🙂 I feel like they will also go really well with our Christmas tablescape… don’t you? I’ve got the ginger beer ready to go! 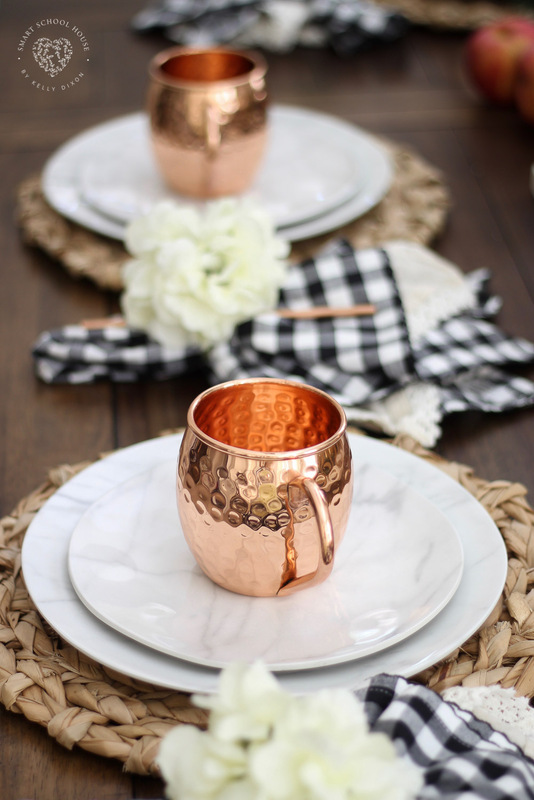 You know what else will taste good in these copper cups? Apple cider! Warm apple cider is so fun to make (and smell!) in the fall. Just for the fun of it, I added some apples to the table. I love the pop of color and the simplicity of using fruit as decoration. The faux marble plates are… get this… ready for it? Melamine! Did I mention that my kids are young enough to still accidentally break things? Beautiful dinnerware that is unbreakable is just that stage of life we are in. I just knew I HAD to have these marble plates when I spotted them. I’m pretty sure I’ll be using them a lot! 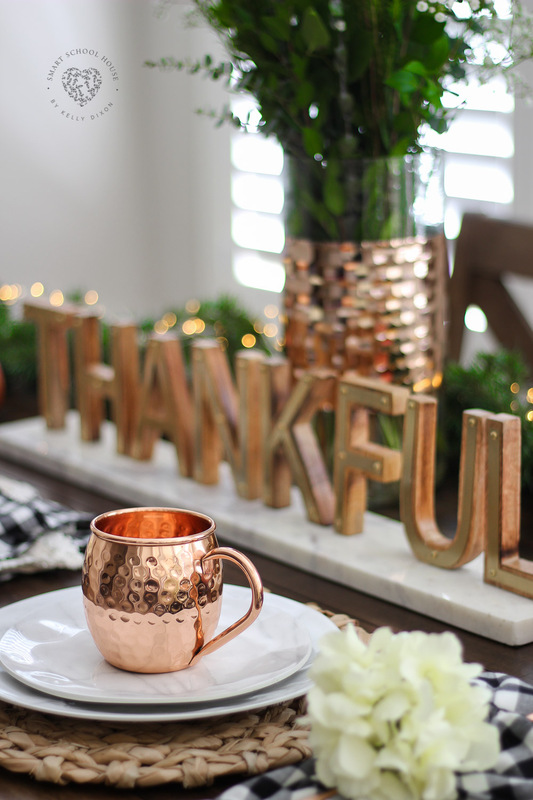 I’m so in love with how this year’s fall tablescape turned out. The warmth of the table makes me excited for Thanksgiving! 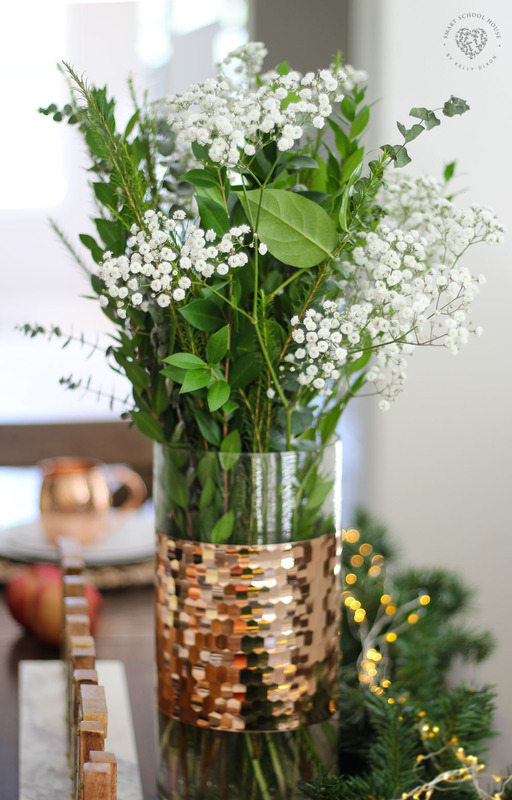 I have a large vase filled with fresh greenery in a glass and copper vase, including eucalyptus, which makes the space smell amazing. The natural grass placemats can be found here. 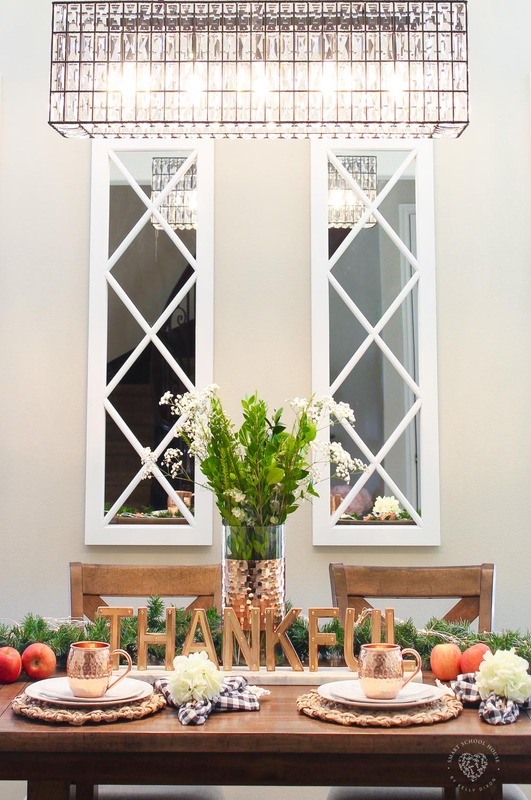 I got the, mirrors, vase, and “thankful” sign at Home Goods.